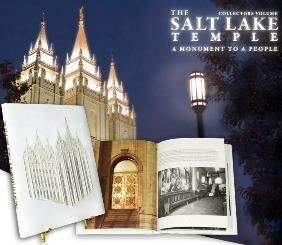 Get A FREE Brochure from "The Salt Lake Temple: A Monument to a People"
This beautiful book will help you and your family celebrate your wedding for years to come! Best of Category winner of the Printing Industries of America’s “Benny” (Benjamin Franklin) Award — bestowed upon those companies that exhibit excellence in printing and design. Selected from nearly 5,000 printed pieces by a panel of discriminating industry professionals. Please mention Salt Lake Bride when you call about this book!